The Sony CyberShot T200 (announced 22 August’07) is a 8.1 MP stylish point-and-shoot camera that features a wide 3.5 inch LCD touch screen, 5x optical zoom (35-175mm), face detection with ‘smile shutter’ for detecting smiles and has HD output for viewing images on HDTVs. 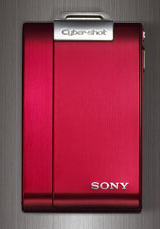 The SONY Cyber-shot DSC-T200 has a shutter speed range of 1"-1/1000, ISO range of 80 to 3200, optical image stabilization and comes in Red, Black and Silver. The camera measures 93.5 x 59.3 x 20.4 mm, weighs 160g and available in black, red and silver.